On the first day of my internship I was invited to attend a meeting between OKEON project leaders Yoshi and Masako and representatives of the Yanbaru Discovery Forest (YDF). 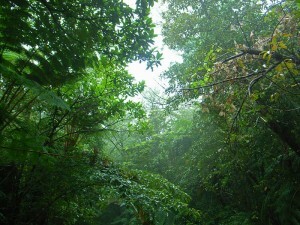 The Yanbaru forested area in Northern Okinawa is known for its natural beauty and endemic species. If you ask local Okinawans about wildlife and the environment, Yanbaru forest is usually mentioned before too long, perhaps due to the strong association with species such as the Yanbaru Kuina bird (やんばるクイナ）or how it is historically uninhabited tropical rainforest. The meeting took place in order to re-establish the link between the OKEON project and YDF.Within local organisations anywhere around the world, without prior introductions, it is not easy to establish connections straight away. This is especially the case in Okinawa. It takes time, with trust and understanding needed in order to gain access to key stakeholders within an organisation. Not only is it important to meet face-to-face with the relevant people, but that relationship has to then be maintained and built upon to be truly successful. Collaboration and communication is key to the success of OKEON. The overall aim of the project is to gain a deeper scientific understanding of the biodiversity and natural environment of Okinawa. However, the key to the project is not science alone, but a diverse network within the local community and other organisations which support and acknowledge the project, and eventually collaborate as well. The longevity of the project depends on this network, and the longer OKEON runs for, the more useful it will be overall in terms of monitoring the terrestrial environment of Okinawa. The YDF in particular is an important organisation for OKEON to establish a relationship with. It is specifically known as an area of valuable nature, and is a conservation hotspot currently being prepared for nomination as a World Heritage site. It is therefore bound to be a place which attracts people who like nature. Visitors to Yanbaru will see information on OKEON and OIST, and perhaps become interested in OKEON, further building the network. Collaboration is a good opportunity for information about OKEON to spread, and to become well-known in the community. YDF can also benefit, as co-operation could lead to new environmental education programs in the future using data from OKEON. As the meeting progressed, what seemed initially to be a meeting where Yoshi and Masako were trying to win over the YDF with the importance of OKEON, there was a gradual shift towards mutual understanding, and by the end of the meeting, a much firmer bond was established. The head of the YDF even asked Yoshi for advice about an ant infestation in one of the rooms, which Yoshi happily went to investigate with his pocket microscope. Not only had the link between the organisations been established, there was talk of future collaboration regarding conservation projects and mounting an explanation of the OKEON project along the trail of the YDF.